In Finding Nemo two clownfish, Marlin and his wife Coral are admiring their new home in the Great Barrier Reef and their clutch of eggs that are due to hatch in a few days. Suddenly, a barracuda attacks them, leaving Marlin unconscious before eating Coral and all but one of their eggs. Marlin names this egg Nemo, a name that Coral liked. The film then moves on to Nemo's first day of school. Nemo has a tiny right fin, due to a minor injury to his egg from the barracuda attack, which limits his swimming ability. After Marlin embarrasses Nemo during a school field trip, Nemo disobeys his father and sneaks away from the reef towards a boat, resulting in him being captured by scuba divers. As the boat sails away, one of the divers accidentally knocks his diving mask into the water. While unsuccessfully attempting to save Nemo, Marlin meets Dory, a good-hearted and optimistic Regal blue tang with short-term memory loss. While meeting three sharks on a fish-free diet, Bruce, a great white shark; Anchor, a hammerhead shark; and Chum, a mako shark, Marlin discovers the diver's mask that was dropped from the boat and notices an address written on it. 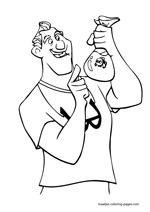 However, when he argues with Dory and accidentally gives her a nosebleed, the scent of blood causes Bruce to lose control of himself and attempt to eat Marlin and Dory. The two escape from Bruce but the mask falls into a trench in the deep sea. During a hazardous struggle with an anglerfish in the trench, Dory realizes she is able to read the address written on the mask, which leads to Sydney, Australia, and manages to remember it. After receiving directions to Sydney from a large school of moonfish, Marlin and Dory accidentally run into a bloom of jellyfish that nearly sting them to death; Marlin falls exhausted after the risky escape and wakes up to see a surf-cultured sea turtle named Crush, who takes Dory and him on the East Australian Current. In the current, Marlin reluctantly shares the details of his journey with a group of young sea turtles; his story spreads rapidly across the ocean through word of mouth and eventually finds Nemo in Sydney. Meanwhile, Nemo's captor - P. Sherman, a dentist - places him into a fish tank in his office on Sydney Harbour. There, Nemo meets a group of aquarium fish called the "Tank Gang", led by a crafty and ambitious moorish idol named Gill. The "Tank Gang" includes Bloat, a puffer fish; Bubbles, a Yellow Tang; Peach, a starfish; Gurgle, a Royal gramma; Jacques, a pacific cleaner shrimp; and Deb, a Blacktailed Humbug. 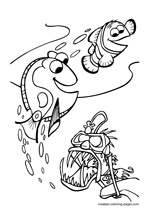 The fish are frightened to learn that the dentist plans to give Nemo to his niece, Darla. She is infamous for killing a goldfish given to her previously by constantly shaking the bag. 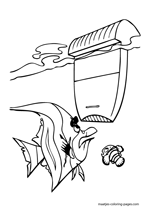 In order to avoid this fate, Gill gives Nemo a role in an escape plan, which involves jamming the tank's filter and forcing the dentist to remove the fish from the tank to clean it manually. 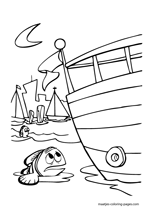 The fish would be placed in plastic bags, at which point they would roll out the window and into the harbor. 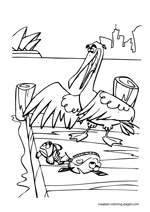 After a friendly pelican named Nigel visits with news of Marlin's adventure, Nemo succeeds in jamming the filter, but the plan backfires when the dentist installs a new high-tech filter. 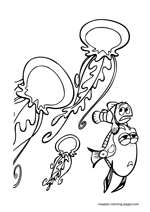 Upon leaving the East Australian Current, Marlin and Dory become lost in the blooms of plankton and krill and are engulfed by a whale. Inside the whale's immense mouth, Marlin desperately tries to escape while Dory communicates with it in whale-speak. In response, the whale carries them to Sydney Harbour and expels them through his blowhole. They are met by Nigel, who recognizes Marlin from the stories he has heard and rescues him and Dory from a flock of hungry seagulls by scooping them into his beak and taking them to the dentist's office. 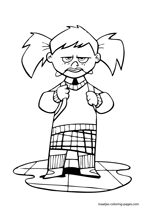 By this time, Darla has arrived and the dentist is prepared to give Nemo to her. Nemo tries to play dead in hopes of saving himself, and, at the same time, Nigel arrives. 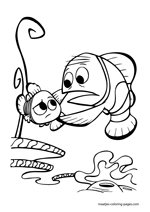 Marlin sees Nemo and mistakes this act for the actual death of his son. 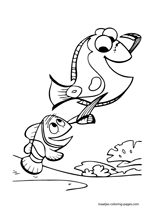 Gill helps Nemo escape into a drain through a sink after a chaotic struggle. Overcome with despair, Marlin leaves Dory and begins to swim back home. Dory then loses her memory and becomes confused, but meets Nemo, who has reached the ocean through an underwater drainpipe. Dory's memory is restored after she reads the word "Sydney" on a nearby drainpipe and, remembering her journey, she guides Nemo to Marlin. 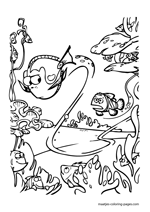 After the two joyfully reunite, Dory is caught in a fishing net with a school of grouper. 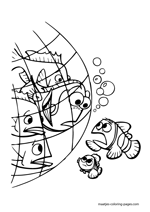 Nemo bravely enters the net and directs the group to swim downward to break the net, reminiscent of a similar scenario that occurred in the fish tank earlier. 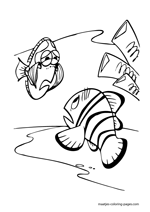 The fish, including Dory, succeed in breaking the net and escape. After some days, Nemo leaves for school once more and Marlin who is no longer overprotective or doubtful of his son's safety, proudly watches Nemo swim away into the distance. Back at the dentist's office, the high-tech filter breaks down and The Tank Gang have escaped into the harbor. However, they realize that they are confined to the bags of water that the dentist put them into when cleaning the tank.